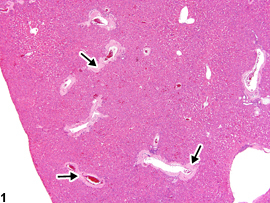 Liver, Artery - Amyloid in a male Swiss Webster mouse from a chronic study. 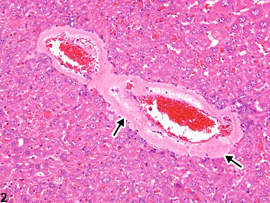 The walls of multiple hepatic arteries are thickened by eosinophilic material (amyloid, arrows). 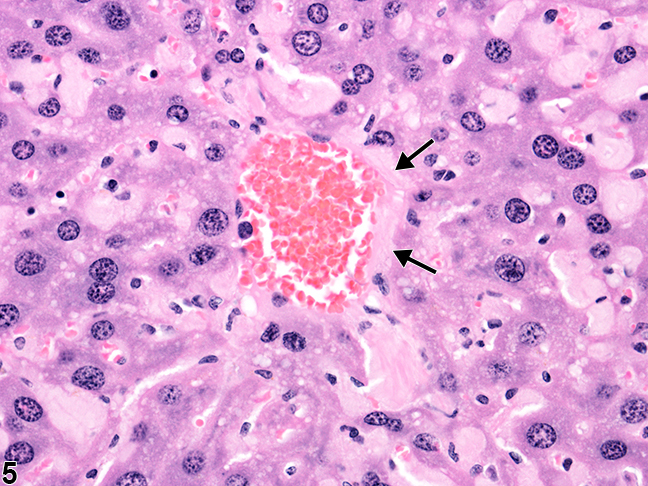 Liver, Artery - Amyloid in a male Swiss Webster mouse from a chronic study (higher magnification of Figure 1). 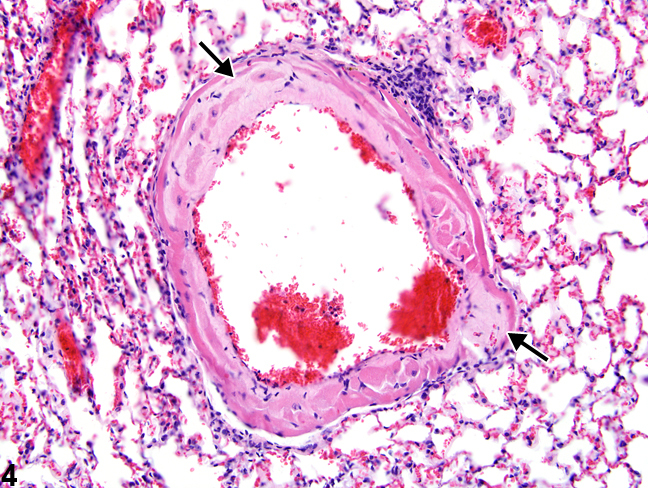 The tunica media of a small artery is thickened by extracellular, eosinophilic material (amyloid, arrows). 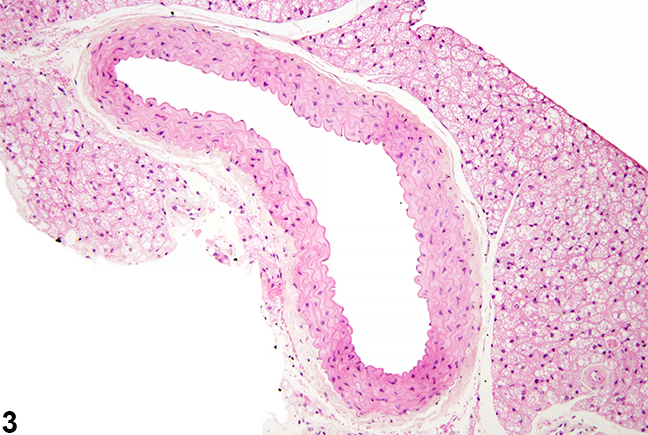 Normal aorta in a male B6C3F1/N mouse from a chronic study. 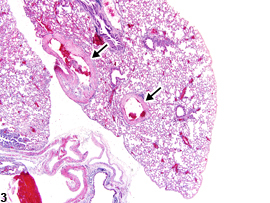 Lung, Artery - Amyloid in a male Swiss Webster mouse in a chronic study. 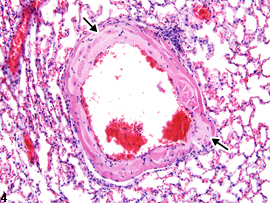 The walls of the pulmonary arteries contain eosinophilic, acellular material (arrows). Lung, Artery - Amyloid in a male Swiss Webster mouse in a chronic study (higher magnification of Figure 3). 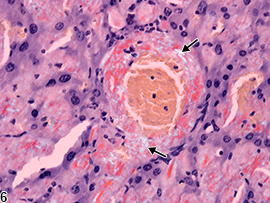 Eosinophilic, acellular material expands the wall of a pulmonary artery (arrows). 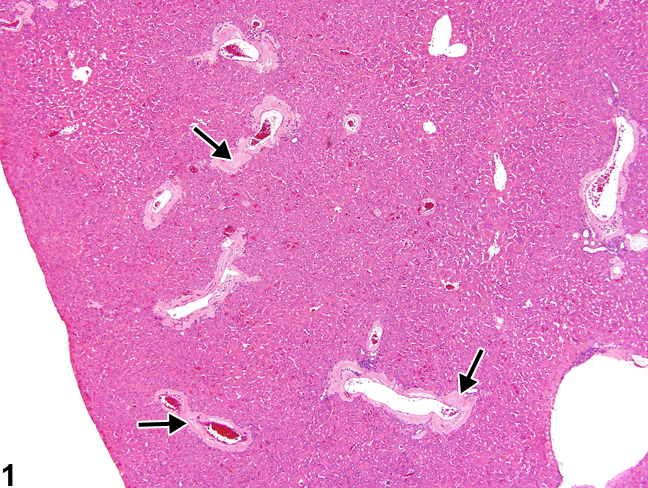 Liver, Artery - Amyloid in a male B6C3F1 mouse from a chronic study. 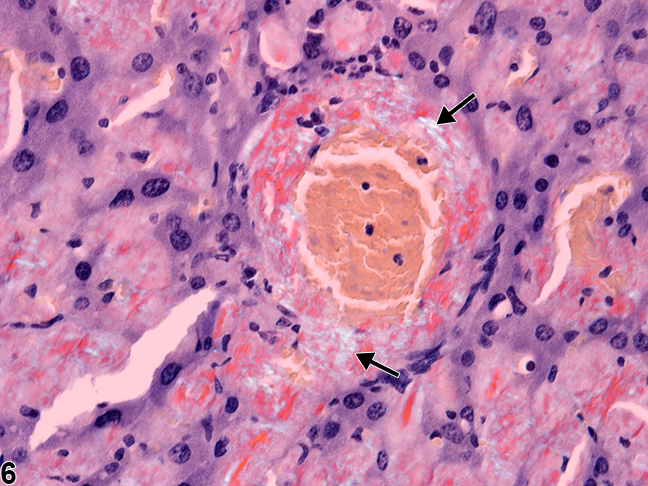 Amyloid expands the wall of a central vein (arrows). 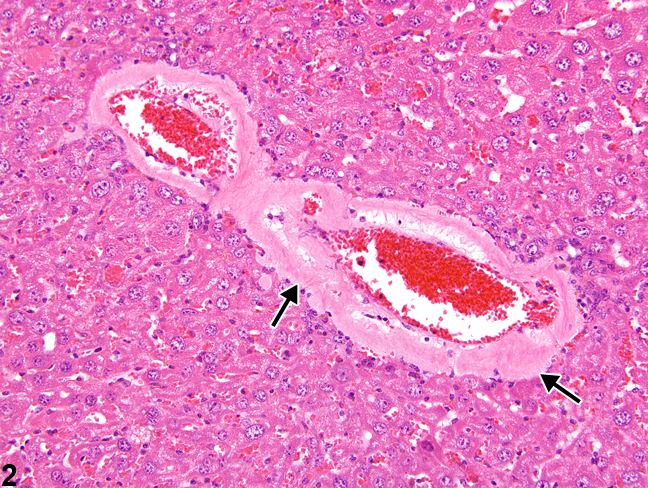 Liver, Vein - Amyloid in a male B6C3F1 mouse from a chronic study. Congo Red staining of amyloid creates apple green birefringence under polarized light (arrows). Amyloid deposition (amyloidosis) is a systemic disease that is rare in B6C3F1, BALB/c, and C3H/HeJ mice and in rats but is common in CD-1, A, Swiss Webster, SJL, and C57BL/6 mice. 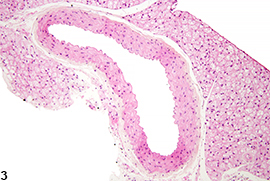 In B6C3F1 mice, vascular deposits can be limited to a single tissue (e.g., jejunum, pancreas, testis). Amyloid appears as an amorphous, eosinophilic, extracellular substance that expands the tunica media and tunica adventitia of small to midsize arteries and, less frequently, veins. Congo red stains amyloid orange to orange-red and under polarized light imparts a light green, so-called apple green fluorescence. Deposition of amyloid damages the tunica media and adventitia of affected vessels, resulting in stenosis of the vascular lumen and fragmentation of the internal elastic lamina. These changes may result in fibrinoid necrosis and microaneurysm formation, predisposing to hemorrhage and infarction. Amyloid should be recorded and graded based on the extent of deposition. Amyloid should be recorded in the organ affected; the type of blood vessel affected should be specified as a site modifier (artery or vein). If the type of blood vessel cannot be determined, the site modifier "blood vessel" may be used. Amyloid in protocol-required blood great vessels, such as aorta, should be recorded with the blood vessel as the site (e.g., Aorta - Amyloid). Elwell MR, Mahler JF. 1999. Heart, blood vessels, and lymphatic vessels. In: Pathology of the Mouse: Reference and Atlas (Maronpot RR, Boorman GA, Gaul BW, eds). Cache River Press, Vienna, IL, 361-380. Kluve-Beckerman B. 2005. High-density lipoprotein amyloid proteins. In: Amyloid Proteins: The Beta Sheet Conformation and Disease (Sipe JD, ed). Wiley-VCH Verlag, Weinheim, Germany, 589-623. Maita K, Hirano M, Harada T, Mitsumori K, Yoshida A, Takahashi K, Nakashima N, Kitazawa T, Enomoto A, Inui K, Shirasu Y. 1988. Mortality, major cause of moribundity, and spontaneous tumors in CD-1 mice. Toxicol Pathol 16:340-349. Woldemeskel M. 2012. A concise review of amyloidosis in animals. Vet Med Int 2012:427296.